Ahhh, the power of Twitter! I ask for a rec on a good audio book and several people recommended this book within minutes. They were SO right - I loved the story, the struggle, and Matt's own personal journey. The opening scenes show Matt's explosive behavior and his lack of coping with the death of his brother in the Iraq war. We soon learn that his brother's death isn't the only loss he has suffered. We jump back in time when his house was a home filled with laughter. Those days are long gone. Matt relives his mothers death and our heart breaks a little right along with him. I've said it before and I'll say it again, I love when books show positive sibling relationships. Matt and T.J. had a friendship along with their obligatory brother relationship. I enjoyed Matt's reflections about the time the two spent camping and just talking under the camp fire. They admired and respected each other. They made plans to go on great adventures and get out from under their dads watchful eye. When Matt discovers letters in his brothers returned belongings, he reels with the fact that T.J. kept secrets from him. Not just a small secrets, but a secret life. Friends he never talked about, and most importantly love that was never spoken of. Matt's militant father and their high-strung, one-sided, almost cruel relationship was hard to listen to. For me, there was no redeeming quality to this man. I wanted Matt to runaway. I wanted him to just get the hell out of that house no matter what it took. I couldn't stand to hear the man beat down his son another minute. Every time Matt heard his father's footsteps on the stairs I got the chilly bumps. I was literally scared for this boy and what his father's anger would bring him. I know there are real-life people out there that treat their children that way, but it was hard to stomach. When Matt decides to go find out who is behind the secret letters, I rejoiced. Yeah, I didn't like that guy. We all deal with grief and loss differently, but it's hard to think Matt's father was doing it the right way. When Matt finally stands face-to-face with the letter writer my heart literally raced. What came next, and everything until the end, was a roller-coaster of emotions for me. I won't spoil a single thing, but I promise you will be surprised more than once. I sobbed, got angry, and was a mushy mess for a long while after finishing. There isn't one thing about this book that doesn't work, and the audio was sensational. Matt's young voice full of hurt and anger was perfect. Then, we have Matt's father with his overpowering and authoritative attitude. 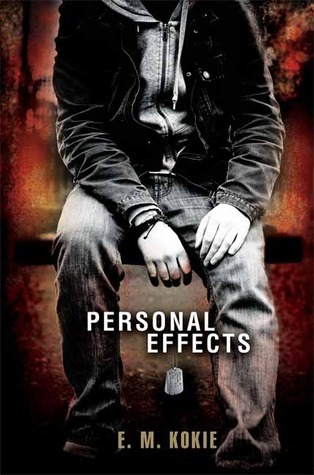 Thanks to, Candlewick there is a brand new audio copy of Personal Effects up for grabs! Fill out the fancy doo-hickey below to be officially entered. US only, good luck!